The mind map data can be copied to the planning. Each node will be an activity in the planning. For more information on how to create a mind map, see Create a mind map. On the page Mind Maps, in the Edit tab, in the Mind Map group, click Copy To Planning. Define the start date time for the project planning. Define the duration for each activity. 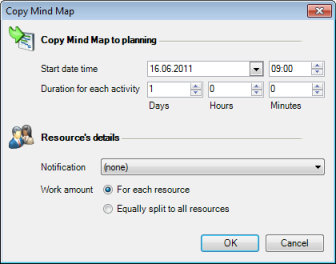 This area is displayed, when you have assigned resources to the mind map. For more information on how to assign the work packages, see Add resources to the node. Choose one of the notification types in the Notification drop-down list. For more information about the different notification types, see Add resources. Workload is applied for each resources All resources will have a capacity utilization of 100 percent. Workload is equally split to all resources The total workload will be distributed equally to each resource. How to convert a mind map to project plan in InLoox PM 7 • Copyright 1999-2019 © InLoox, Inc. All rights reserved.